Change point analysis or change detection deals with abrupt changes in statistical properties of time series. bayesloop includes two types abrupt changes: an abrupt change in parameter values is modeled by the transition model Changepoint. In contrast to this change in value, the transition model itself may change at specific points in time, which we will refer to as structural breaks. These structural changes are implemented using the SerialTransitionModel class. The following two sections introduce the ChangepointStudy class and describe its usage to analyze both change-points and structural breaks in time series data. The ChangepointStudy class represents an extention of the HyperStudy introduced above and provides an easy-to-use interface to conduct change-point studies. By calling the fit method, this type of study first analyzes the defined transition model and detects all instances of the Changepoint class. Instead of directly using all combinations of predefined change-points provided by the user, it then computes a list of all valid combinations of change-point times and fits them (basically preventing the double-counting of change-point times due to reversed order). With Bayesian evidence as an objective fitness measure, this type of study can be used to answer the general question of when changes have happened. Furthermore, we may compute a distribution of change-point times to assess the (un-)certainty of these points in time. Note: For simple change-point analyses with only one change-/break-point or multiple change-/break-points which do not “overlap”, using the HyperStudy class is sufficient, too. 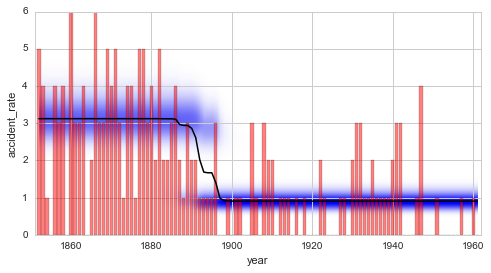 In a first example, we assume a single change-point in our data set of coal mining disasters. Using the ChangepointStudy, we iterate over all possible time steps using the change-point model. 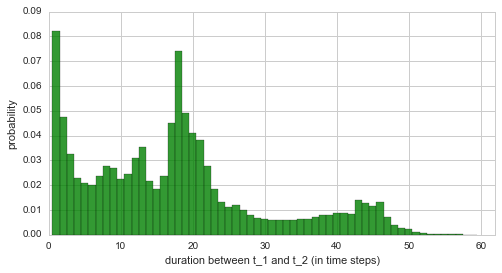 After processing all time steps, the probability distribution of the change-point as well as an average model are computed. This study may also be carried out using MCMC methods, see e.g. the PyMC tutorial for comparison. The change-point study is set up as shown below. Note that we supply the value 'all' to the change-point hyper-parameter 'tChange', indicating that all possible time steps are considered as a change-point. One could of course also provide a list of possible candidate time steps. + 109 analyses to run. 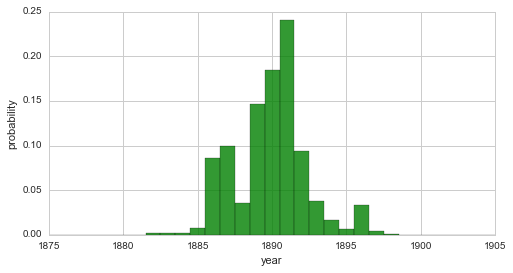 From this distribution, we may conclude that a change in safety conditions of coal mines in the UK happened during the seven-year interval from 1887 to 1893 with a probability of \(\approx 84\%\). The change-point study described above explicitly assumes the existence of a single change-point in the data set. Without any prior knowledge about the data, however, this assumption can rarely be made with certainty as the number of potential change-points is often unknown. In order to explore possible change-points without prior knowledge, bayesloop includes the transition model RegimeSwitch, which assigns a minimal probability (specified on a log10-scale by log10pMin, relative to the probability value of a flat distribution) to all parameter values on the parameter grid at every time step. This model allows for abrupt parameter changes only, and neglects gradually varying parameter dynamics. Note that no ChangepointStudy is needed for this kind of analysis, the “standard” Study class is sufficient. Suppose the regime-switching process introduced above indicates two distinct change-points in a data set. In this case, the ChangepointStudy class can be used together with a CombinedTransitionModel to perform a comprehensive analysis assuming two change-points. The combined transition model here simply consists of two instances of the ChangePoint model. We use the example below to investigate possible change-points in the disaster rate after the significant decrease at the end of the 19th century, i.e. 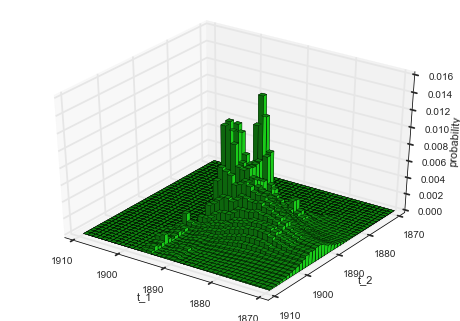 restricting the data set to the time after 1900. Note that the ChangepointStudy will only consider combinations of change-points that are in ascending temporal order, i.e. the second change-point must occur after the first one. After all fits are done, the resulting joint change-point distribution can be plotted using the getJointHyperParameterDistribution (getJHPD) method (similar to plotting the joint distribution of a hyper-study). + 1770 analyses to run. 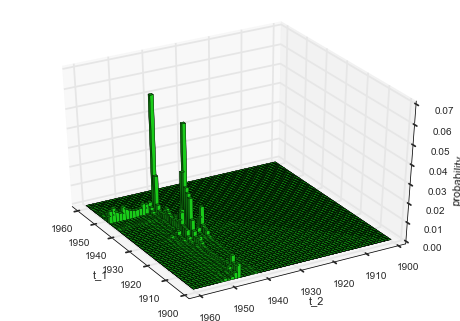 Finally, we plot the averaged parameter evolution of the two-change-point model. 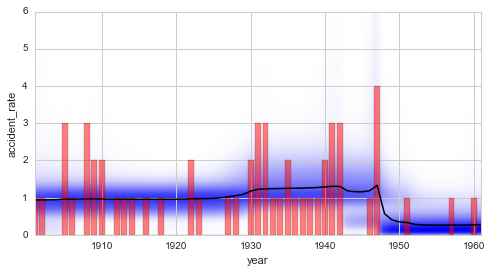 From the duration distribution as well as from the temporal evolution of the inferred disaster rate we may conclude that there is indeed a time period with a slightly increased disaster rate, which begins in \(\approx\) 1930 and ends in \(\approx\) 1945. 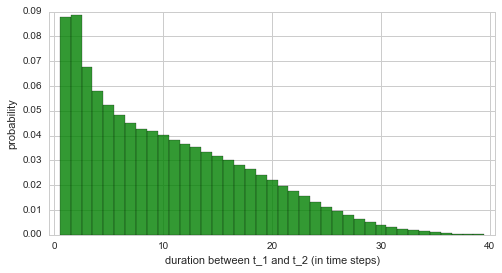 The duration distribution underlines this finding with high probability values for durations up to 20 years. In contrast to a pure change in parameter value, the whole type of parameter dynamics may change at a given point in time. We will use the term structural break to describe such events. We have already investigated so-called serial transition models that describe parameter dynamics which change from time to time. While these serial transition models are a re-occurring topic in this tutorial (see here, here and here), the times at which the structural breaks happen have - up to this point - always been user-defined and fixed. This restriction can be lifted by the ChangepointStudy class. If a SerialTransitionModel is defined within the change-point study, all structural breaks will be treated as variables and the fit method will iterate over all possible combinations, just as with “normal” change-points. In this section, our goal is to build a model to determine how long it took for the disaster rate to decrease from \(\approx\) 3 disasters per year to only \(\approx\) 1 per year. This kind of study may generally be applied to assess the effectivity of policies like safety regulations. 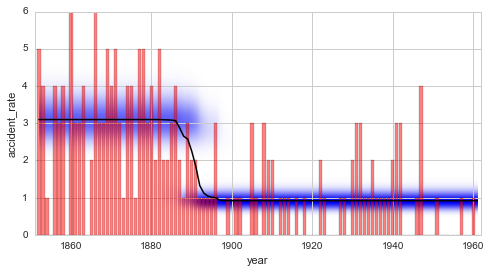 Here, we devise a simple serial transition model that consists of three phases to describe the change in the annual number of coal mining disasters: in the first and the last phase, we assume a constant disaster rate, while the intermediate phase is modeled by a linear decrease of the disaster rate. By providing multiple values for the slope of the intermediate phase, we can combine the advantages of both hyper- and change-point study in order to consider the uncertainty of the change-points and the uncertainty of the slope of the intermediate phase. 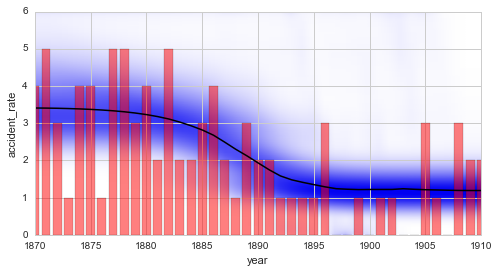 We restrict the data set to the years from 1870 to 1910, and assume an improvement of the disaster rate by 0 to 2.0 disasters per year. + 23400 analyses to run.
! 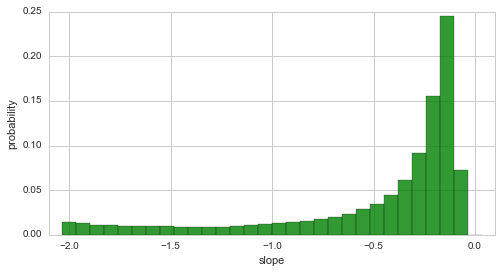 WARNING: Posterior distribution contains only zeros, check parameter boundaries! Stopping inference process. Setting model evidence to zero. Finally, we want to stress the difference between change-points and break-points again: If the BreakPoint transition model is used within the SerialTransitionModel class, different transition models will be specified before and after the break-point, but the parameter values will not be reset at the break-point. In contrast, the ChangePoint transition model can also be used in a SerialTransitionModel (not shown in this tutorial). In addition to the different parameter dynamics before and after the change-point, this case allows for an abrupt change of the parameter values. Finally, if the ChangePoint model is used without a SerialTransitionModel, the parameter dynamics will stay the same before and after the change-point, but an abrupt change of the parameter values is expected.